I approach the Sarasota County Schools building a bit after 3 p.m. on Tuesday, July 20 to see a handful of people in front passing out white T-shirts with green lettering that reads “Choose History, not His-Story.” As I pass through the foyer and enter the meeting room I spot about three dozen people wearing those shirts, scattered throughout a packed house of roughly 200. Sarasota County School Board Chair Shirley Brown helps her six-year-old grandson use a microphone to open the meeting with a recitation of the Pledge of Allegiance. The stage is set for the day’s main event. Dr. Richard Swier, editor of local conservative blog Red County, will have his chance to appeal the decision of a district advisory committee that denied his “request for reconsideration of instructional material,” a formal complaint originally filed on April 25. Swier sought to have the textbook World History: Patterns of Interaction removed from the school curriculum, believing that it unfairly favors the religion of Islam over Christianity. The right-wing positions adopted by Swier are no secret among the Sarasota community — former CL editor Cooper Levey-Bakerregularly criticized his Red County posts on our blog. From advocating the dismemberment of homosexuals, to encouraging armed revolt against our own government, to calling a popular Gainesville solar panel-promoting tariff “stealth welfare for tree huggers,” Swier is every local far-right-wingers Golden Boy. But this textbook fiasco appears to be the result of a new project he’s working on. Swier recently started a Sarasota chapter of ACT! for America, a group founded by noted Islamophobe Brigitte Gabriel, author of bestselling books Because They Hate: A Survivor of Islamic Terror Warns America, and They Must Be Stopped: Why We Must Defeat Radical Islam and How We Can Do It. ACT!’s mission statement says their goal is to, “inform, educate and mobilize Americans regarding the multiple threats of Islamofascism, and what they can and must do to protect themselves and their country against this determined enemy.” Shortly after Swier’s appeal was granted, Gabriel posted a blog on the Red County website titled, “Major Development on the Textbook Front! ACT! for America’s Sarasota Chapter Achieves a First in Florida State History!” Apparently, she’s quite fond of exclamation points. 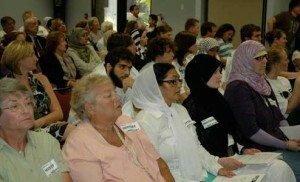 Over the course of his anti-textbook crusade, Swier exchanged several emails with the School Board and Superintendent Lori White, including one titled “Joys of Muslim Women,” attributed to former Muslim and human rights activist Nonie Darwishwarning of Islam’s intention to destroy Western civilization by imposing Sharia law, although much of the article refers to Darwish in the third person. The email is commonly circulated among Glenn Beck fans. Swier also supplied the board with reading material like The Muslim Masquerade: An Unveiling of Islam’s Façade, and The Trouble with Textbooks: Distorting History and Religion, which specifically lists World History: Patterns of Interaction as a book favorable to Islam. The educational material that Swier, who ran unsuccessfully for a School Board position in 2002, has recommended to replace the contended textbook is a ten-part series of 64-page books by Mason Crest Publishers called World of Islam. The cover of one volume in the series, titled Radical Islam, depicts an AK-47 sitting atop an Arab-style garment soaked in blood. The board feels that the series is not a suitable replacement, thanks both to the $229 price tag (compared to the current book’s $83), and because the series is classified at a sixth-grade reading level. After about 50 minutes of proceedings dealing with the poor nutritional value of cafeteria food and a$2.5 million gift to county schools from the Venice Community Foundation, the board votes to open up discussion on the “resolution of challenged material appeal.” Brown announces that 47 cards have been approved, each allowing concerned citizens three minutes to speak. After the public gets its turn, Swier will have ten minutes, then ten minutes for a review committee member, then they each get a five minute rebuttal. It’s going to be a long afternoon. The next six speakers take the podium in opposition to the textbook before Harvey Gochberg rises as the first in support. “I can’t tell you which religion wins the most killed of innocents,” he says. From here the cards begin to shuffle, and the players start raising the stakes. Gene Tischer’s is the next card dealt as he takes the stand. “We used to be a Judeo-Christian nation and we’ve moved away from that because it’s politically correct or whatever,” he says, “but don’t go to the other shore and demote Christianity and elevate Islam. Slowly Islam becomes something very attractive without people even knowing what they’re buying into.” He then reminds the board to watch those videos Esther sent them. From this point on the cards cease to shuffle so randomly. 25 people in a row rise to voice their support for the continued use of World History: Patterns of Interaction, many of them Muslims detailing the intricacies and common misunderstandings surrounding their faith. They point out why the review of the material by Dr. Terri K. Wonder, a doctor of Middle Eastern studies who is Swier’s primary expert referenced, is flawed in many ways. Many of the supporters are troubled that Swier had apparently not talked to an actual Muslim when compiling the evidence for his case. They explain that jihad is not actually one of the five pillars of Islam; that it is not a call to holy war against Western culture; and how Islamic women are not seen as second-class citizens, all of which Swier and others opposed to the textbook deny. Other complaints posed by Swier are rebuked more with common sense than religious knowledge. Swier has a problem with the book’s contention that Christians “regard” Jesus as the Son of God rather than “know” he is. He also finds fault in the book’s referring to theProphet Mohammad with a capital “P,” a simple case of textbook grammatical style, as the book uses a lowercase “p” later when not using the term as an official title. Swier asserts that many more of the book’s pages are dedicated to Islam than are toward Christianity. In reality, there are 23 pages devoted to Christianity and 21 to Islam. Swier may have taken many of these rebuttals into account, if he was in the room. As it becomes apparent that supporters will have control of the microphone for some time, I notice Swier is mysteriously absent from his seat. I escape to the foyer to find him talking to an angry opponent of the book, later revealed to be Carol Holland. I approach Swier, shake his hand, and ask why he left the meeting. As he begins to speak about how only in a Judeo-Christian Republican nation could we have such a free exchange of religious discourse, a blond woman in a pink tank top bursts through the door toward Swier, exclaiming, “the whole God-damned Muslim nation is in there!” Holland is quick to hush her. During their closing statements the board members each give their reasons why they will be voting to keep the book, effectively taking the anticipation out of the final vote. At one point during Brown’s comments she says, “This is not a Judeo-Christian nation, but a nation of Judeo-Christians, founded by people fleeing religious persecution in Europe.” This prompts pink tank-top lady, who I now know to be Eileen Green, and others to storm out of the room flailing their arms in disgust. The video of the July 20 Sarasota County School Board meeting that heard Dr. Rich Swier’s “challenged material appeal” can be viewed here, complete with some of our favorite quotes from the meeting and the times where you can find those speaker’s comments.